What is “core strength”, and what does it do for us? Core strength is the ability to stabilize one part of the body to be able to move another part. Your core includes hundreds of muscles predominantly within the trunk, hips, and shoulder girdle. Core strength makes you look and feel like a champ by improving posture, and giving you a strong confident appearance. 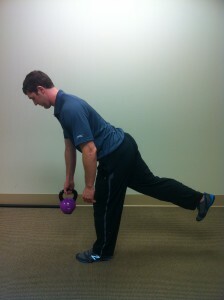 Hip Hinge: Stand on one leg with a weight in opposite hand. Slowly reach the weight towards the floor keeping the back straight. Keep control of the movement and return to the start position. Repeat for 2 sets of 15 repetitions. 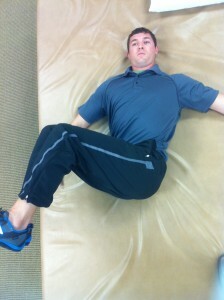 Lower Trunk Rotation: Lie on your back with arms out to the sides and the knees up. Slowly rotate to the left while maintaining both shoulder blades in contact with the floor. Control the side to side movement of your legs, by keeping your lower back flat. Slowly rotate your legs back and forth from side to side. Repeat for 2 sets of 10 times each. For more information on core strength, and optimal fitness, send us an email, facebook or twitter message. Or call us at 504 841 0150.